Visiting an old manor house is hardly Katie’s idea of an adventure. When an enchanted painting whisks Katie back in time to Shakespeare’s England, she lands in the middle of a perilous adventure beyond her wildest imagination. With the help of Princess Sophia, Katie begins to find her feet in the world of superstitious maids and looming lords … that is, until a mysterious murder sends Otterly Manor into mayhem. With danger and mystery lurking around every corner, can Katie solve the mystery of Otterly Manor and find a way home before it’s too late? Katie Watson is just the sort of character I enjoy most: a sassy twelve year old in search of adventure, who also likes to read. When the story opens, she’s dreading what she thinks will be a boring summer, and sulking over a forced separation from her favorite horse and older brother. 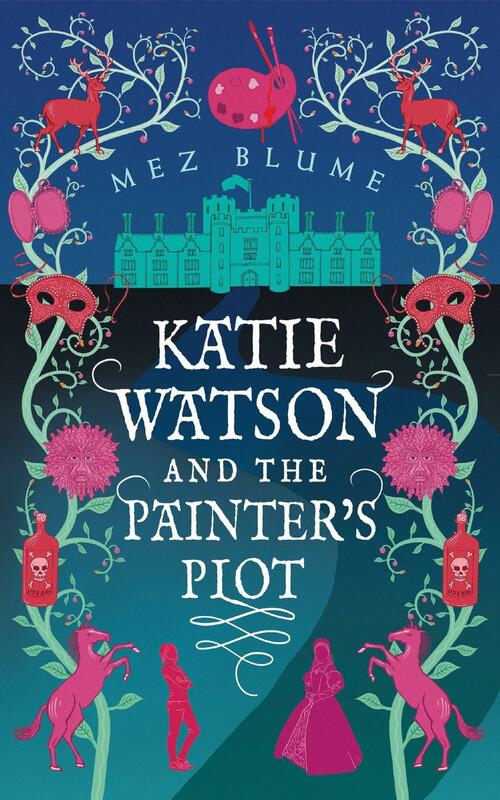 Then her English grandparents take her to tour a local castle, where Katie’s wish for adventure propels her back through a magic painting into the 1600s. She is discovered by Princess Sophia, a girl her own age, and they instantly become friends (because the princess is sassy too). There’s a bit too much scene-setting in the beginning, but once we go back in time it’s a grand romp through the old castle, complete with secret doors and dining details (for both servants and royalty). There’s also a wild horse, plenty of lords and ladies, and a shocking murder. While the some of the plot devices are a bit cliché, there are enough unique twists and historical details to add depth and keep the story from becoming too predictable. The ending is a perfect example of why predictable is still satisfying; Katie defies personal danger to stand up for what’s right, but she also slays some personal demons along the way. Though I did spot a few minor typos and grammatical issues, they didn't interfere with a great read. Though this is written for a middle grade audience, I'd recommend it for readers of any age who like their time travel spiced up with murderous intrigue. “Have a good trip,” I told Fergie and Francis as I pushed a bowl of pellets into their crate. “At least you’ll be going on an adventure this summer. Not like some of us.” Fergie squeaked, which might have been sympathy in guinea pig language. But judging by their blank expressions as they furiously nibbled their pellets, I wasn’t convinced they really understood how I was feeling. There was a ding dong from the doorbell. “That’ll be your ride,” I informed the guinea pigs. I hoisted my duffel bag over one shoulder, then squatted to pick up the crate from its place below the hooks where all my riding ribbons hung. As I stood up, the ribbons brushed against my hair, as if to tease me. I gritted my teeth and turned away. Waddling down the hallway, I stopped in front of Charlie’s room. His door was open, but he had his back to me, taking the posters from his wall and rolling them up for packing. The room looked as sad and bare as an undecorated Christmas tree. The sight of its blandness made me feel hollow and lonely, like things would never be the same again. Why did this summer ever have to come? Normally, summers couldn’t come soon enough. I would count down the days on my horse wall calendar until we could pack up our bags and head off to England to visit my grandparents. Charlie and I call them Nan and Pop, and we’ve spent every summer with them since I was born. That was part of “the deal” when my English mum agreed to marry my dad and move to America. Summers in England really are superb. Nan and Pop live in an old farm house in Kent with woods, blackberry brambles, an old barn and even a wishing well. Charlie and I always played orphans out there, pretending to live in the barn and throw wishes into the well that one day we would live in a palace with servants to bring us tea and extra buttery scones on silver trays whenever we liked. Then, when Nan called us into the house for tea time and brought us a tray of fresh baked scones, we’d imagine she was our servant and laugh at our secret joke. Nan said we were cheeky, but always with a smile. Of course our games became more sophisticated later on, when I got old enough to start reading murder mysteries. Then Charlie became Sherlock Holmes and I was his right-hand man, Watson; we’d think up all kinds of crimes to solve around the farm and the village. As I stood there remembering it all, the crate tipped, and one of the guinea pigs gave a loud, complaining reek. I moved away from Charlie’s open door before he could turn around. I didn’t feel like talking; and anyway, all he ever talked about these days was the new life awaiting him in Scotland and all the exciting things he planned to do at university. He didn’t have time for silly games with an eleven-year-old sister anymore. He had real adventures to look forward to now. I hobbled downstairs. Dad had got to the door first and was chatting to Miss Thaxton. When she noticed me, her eyes widened and her mouth stretched into an unusually toothy smile. “Is anyone, you know … riding him these days?” I asked with dread nibbling at my stomach. I swallowed and nodded, then slipped quietly into the dining room while Dad carried the guinea pigs out to Miss Thaxton’s truck. I poked at the lumps of oats and shook my head again. Without looking at Mum, I reached down and pulled the mystery novel I was reading from my duffel bag. Propping it open on the table, I pretended not to notice as she sprinkled raisins and syrup into my porridge. “It’s still not fair,” I grumbled under my breath and leaned over my book with my head in my hands. Then she turned right on her heels and started scrubbing the porridge pot before I had the chance to exercise my contrary mood. So frustrating that we are so much alike, I thought. From our lanky limbs and strawberry-coloured hair to our love of riding horses. Mum always knows what I’ll argue back before I do and always has me blocked. I knew what I wanted to say. Maybe that’s how it worked in books — maybe characters have to go through all sorts of rubbish to get their adventures. But it didn’t make me feel any better, and it certainly didn’t persuade me that having my life turned upside down was any kind of adventure worth having. “It’s just clothes and a few books,” I spat out, rushing over. But before I could step in, she’d unzipped the bag and found them: the riding helmet and boots I’d stuffed right down at the bottom, hoping they’d stay hidden there until Mum and Dad and Charlie went off to Scotland and left me alone with Nan and Pop. Mum would never agree to let me go to riding camp; she would want me to follow the doctor’s orders and take it easy. But if I asked my grandparents nicely enough, they were sure to give in. At least they would have done. Now I was busted. “Katie, what is this?” She held out the riding helmet, her eyebrows raised and waiting for an explanation. I looked away from her, a puff of hot air fuming from my nostrils. Mum looked uncertainly at me for half a moment. Maybe she was coming around after all! Mum gave him a look that meant not now, for Pete’s sake. I wish she hadn’t. It only made him take note of my red face and puffy eyes. I spun away from Mum, still standing there holding my riding helmet, pushed past a speechless Charlie and his hiking pack, and ran out of the front door, narrowly missing Dad as he walked up the driveway. I didn’t stop until I got to the old tree swing in the backyard. I couldn’t stand it. I knew when the others felt sorry for me — the poor little girl who fell off her horse and went into shock every time she tried to get back on. I used to be good! Gypsy and I used to ride like champions, to jump, to fly! Now I was just a pathetic eleven-year-old with a scar on her head and a sheltered, adventure-less life. Everything had changed for me. Everything felt so uncertain … except for one thing. Unless a miracle happened, this summer would be the worst of my life.